FEATURING: EINAR “EFFI” FALUR INGOLFSSON & RAGNAR AXELSSON. Iceland is a land of otherworldly beauty and stark contrasts, where folklore and tradition are as tangible as its vast, volcanic landscapes and wind-lashed coastlines. For centuries, artists have found inspiration in the extraordinary people, culture, wildlife and land of this North Atlantic island. Reykjavik, the capital, and the surrounding area provide a perfect setting for our nine-day documentary photography workshop. This assignment-based course is intended for photographers of all levels interested in developing their fine art and documentary photography practice. The workshop makes the most of all that the city and the country have to offer: from the award-winning modern architecture in the capital (such as the Harpa concert hall and the striking Hallgrímskirkja church), to the vibrant cultural scene (including the Reykjavik Pride festival, which takes to the streets during our workshop), to the spectacular landscape shaped by glaciers and volcanoes. During this one-of-a-kind workshop, assignments will explore the best of what Iceland has to offer. Students will have the opportunity to shoot local farmers and fisherman, Icelandic horses, live concerts and nightlife, street scenes in Reykjavik, world-famous landmarks like the Blue Lagoon, among many other topics. With the guidance of two of Iceland’s most renowned photographers, Einar Falur Ingólfsson and Ragnar Axelsson, and the support and expertise of an all-local team, you will have the chance to delve into the country’s rich and varied culture, and present it in a truly unique way. Our trove of local contacts and story suggestions will be at your disposal, too, so you can spend your days honing your creative skills instead of thinking about where to start. On the first day, students will present their portfolio to the group at the Ljósmyndaskólinn School of Photography. They will then discuss their ideas for the projects they would like to focus on over the course of the workshop. Depending on what students choose, the instructors and team of assistants will then help them arrange the logistics of their projects. Those who choose to travel beyond the capital for their photo shoots can either rent a car (book in advance as demand can be high in summer) or make use of Iceland’s comprehensive public transport system. Most Icelanders speak English, which gives students more freedom in both traveling around the island and getting to know the locals. Each morning, students will be able to meet with the instructors one-on-one to edit and critique the previous day’s work during 20-minute sessions. 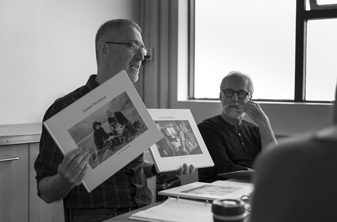 Einar Falur Ingólfsson and Ragnar Axelsson will offer feedback and their years of experience to help students to become better photographers. For the rest of the day, you will be focused on your project, working independently. The team of assistants will be available if you need help setting up meetings with subjects or have other logistical requirements for that day’s shoot. Every evening, the group will gather together to talk about their assignments and what assistance they might need for the following day, before attending a lecture featuring local artists and experts who will share their work and discuss their experiences, both as professionals and as native Icelanders. Previous guests have included the esteemed photographers Páll Stefánsson, Gudmundur Ingólfsson, and Kristinn Ingvarsson – as well as the photo-historian Inga Lara Baldvinsdottir and the fashion designer Steinunn Sigurdardóttir. Towards the end of the workshop, the instructors will accompany interested students on a landscape photography excursion. On the last day, we will have a final group critique at Iceland’s National Museum. The best images will be selected and displayed for the public that afternoon in the museum auditorium and will also be compiled into a beautifully-designed blurb book that will be available for purchase after the course. This class is for photographers of all levels. Students should bring their portfolio, consisting of 15-20 images, either prints or files. Each participant is responsible for providing their own digital camera and related equipment, including a laptop with installed editing software such as Bridge or Lightroom, as well as sufficient memory cards and batteries to shoot for the length of an entire day. Students should plan to arrive in Reykjavik, Iceland, either on August 4th or 5th at the latest. The first activity is a welcome dinner on the evening of Sunday August 5th. The class ends on Monday August 13th during the evening, participants should plan to depart on Tuesday August 14th. Reykjavik, Iceland is served by IcelandAir from Boston, Minneapolis/St. Paul, New York JFK, Orlando Sanford and Seattle and also by Wow Air from San Francisco, New York, Boston, Los Angeles, Washington D.C., Montreal and Toronto, and by Delta. Download the Pdf of the Trip. Iceland residents fee is $1,495.00 USD. There is a wide range of options on www.airbnb.com and our students in the past have found the best lodging deals online through it. Please note that in the last couple of years a good number of new hotels, hostels and guesthouses have opened in Reykjavik and therefore there are many options to explore. Einar “Effi” Falur Ingolfsson was born in 1966. He was only fourteen’s years old when he started working as a photographic-stringer for Morgunbladid, Iceland’s leading newspaper, later he completed a degree in literature at the University of Iceland and an MFA in Photography at the School of Visual Arts, New York in 1995. He spent 15 years as the Director of Photography of Morgunbladid, Iceland’s leading newspaper. His photographs have appeared in many exhibitions in museums and galleries, books, newspapers, and periodicals both in Iceland and abroad. Ragnar Axelsson has dedicated his career to the subsistence hunters, fishermen and farmers of the circumpolar area that live on the fringe of the habitable world. Since the early 1980’s he has travelled to the Arctic, documenting the lives of the Inuit hunters in Northern Canada and Green-land, the farmers and fishermen in the North-Atlantic region and the indigenous people of Northern Scandinavia and Siberia. His stories have appeared in print media publications such as Time magazine, Life, Stern, GEO, Polka, Wanderlust, Geographical and Newsweek, and are the subject of his major photography books: Faces of the North (2004 – republished in an extended version in 2015), Last Days of the Arctic (2010) and Behind the Mountains (2013). Behind his oeuvre is a strong conviction that the traditional culture of the Arctic people is disappearing and will not be able to resist the disrupting effects of larger forces of economy and climate change. In 2011 a documentary on his work was released, Last Days of the Arctic¬ – Capturing the Faces of the North, produced by BBC4, NDR, ARTE and ITVS.